This chapter introduces modeling of ``lumped'' physical systems, such as configurations of masses, springs, and ``dashpots''. The term ``lumped'' comes from electrical engineering, and refers to lumped-parameter analysis, as opposed to distributed-parameter analysis. Examples of ``distributed'' systems in musical acoustics include ideal strings, acoustic tubes, and anything that propagates waves. In general, a lumped-parameter approach is appropriate when the physical object has dimensions that are small relative to the wavelength of vibration. Examples from musical acoustics include brass-players' lips (modeled using one or two masses attached to springs--see §9.7), and the piano hammer (modeled using a mass and nonlinear spring, as discussed in §9.4). In contrast to these lumped-modeling examples, the vibrating string is most efficiently modeled as a sampled distributed-parameter system, as discussed in Chapter 6, although lumped models of strings (using, e.g., a mass-spring-chain ) work perfectly well, albeit at a higher computational expense for a given model quality [69,145]. In the realm of electromagnetism, distributed-parameter systems include electric transmission lines and optical waveguides, while the typical lumped-parameter systems are ordinary RLC circuits (connecting resistors, capacitors, and inductors). Again, whenever the oscillation wavelength is large relative to the geometry of the physical component, a lumped approximation may be considered. As a result, there is normally a high-frequency limit on the validity of a lumped-parameter model. For the same reason, there is normally an upper limit on physical size as well. We begin with the fundamental concept of impedance, and discuss the elementary lumped impedances associated with springs, mass, and dashpots. These physical objects are analogous to capacitors, inductors, and resistors in lumped-parameter electrical circuits. Next, we discuss general interconnections of such elements, characterized at a single input/output location by means of one-port network theory. In particular, we will see that all passive networks present a positive real impedance at any port (input/output point). A network diagram may be replaced by an impedance diagram, which may then be translated into its equivalent circuit (replacing springs by capacitors, masses by inductors, and dashpots by resistors). In the following chapter, we discuss digitization of lumped networks by various means, including finite differences and the bilinear transformation. In the lossless case (no dashpots, only masses and springs), all driving-point impedances are purely imaginary, and a purely imaginary impedance is called a reactance. A purely imaginary admittance is called a susceptance. The term immittance refers to either an impedance or an admittance . In mechanics, force is typically in units of newtons (kilograms times meters per second squared) and velocity is in meters per second. In acoustics [317,318], force takes the form of pressure (e.g., in physical units of newtons per meter squared), and velocity may be either particle velocity in open air (meters per second) or volume velocity in acoustic tubes (meters cubed per second) (see §B.7.1 for definitions). The wave impedance (also called the characteristic impedance) in open air is the ratio of pressure to particle velocity in a sound wave traveling through air, and it is given by , where is the density (mass per unit volume) of air, is the speed of sound propagation, is ambient pressure, and is the ratio of the specific heat of air at constant pressure to that at constant volume. In a vibrating string, the wave impedance is given by , where is string density (mass per unit length) and is the tension of the string (stretching force), as discussed further in §C.1 and §B.5.2. In circuit theory , force takes the form of electric potential in volts, and velocity manifests as electric current in amperes (coulombs per second). In an electric transmission line, the characteristic impedance is given by where and are the inductance and capacitance, respectively, per unit length along the transmission line. In free space, the wave impedance for light is , where and are the permeability and permittivity, respectively, of free space. One might be led from this to believe that there must exist a medium, or `ether', which sustains wave propagation in free space; however, this is one instance in which ``obvious'' predictions from theory turn out to be wrong. Figure: The ideal mass characterized by . This is the transfer function of an integrator. Thus, an ideal mass integrates the applied force (divided by ) to produce the output velocity. This is just a ``linear systems'' way of saying force equals mass times acceleration. Since we normally think of an applied force as an input and the resulting velocity as an output, the corresponding transfer function is . The system diagram for this view is shown in Fig. 7.3. In this instance, setting the input to corresponds to transferring a unit momentum to the mass at time 0. (Recall that momentum is the integral of force with respect to time.) Since momentum is also equal to mass times its velocity , it is clear that the unit-momentum velocity must be . 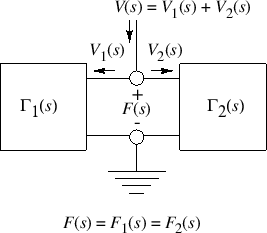 Figure 7.3: Input/output description of a general impedance, with force as the input, velocity as the output, and admittance as the transfer function. Again, this is just the frequency response of an integrator, and we can say that the amplitude response rolls off dB per octave, and the phase shift is radians at all frequencies. In circuit theory, the element analogous to the mass is the inductor, characterized by , or . In an analog equivalent circuit, a mass can be represented using an inductor with value . Figure 7.4 depicts the ideal spring. Figure 7.4: The ideal spring characterized by . This is the transfer function of a differentiator. We can say that the ideal spring differentiates the applied force (divided by ) to produce the output velocity. In this case, the amplitude response grows dB per octave, and the phase shift is radians for all . Clearly, there is no such thing as an ideal spring which can produce arbitrarily large gain as frequency goes to infinity; there is always some mass in a real spring. We call the compression velocity of the spring. In more complicated configurations, the compression velocity is defined as the difference between the velocity of the two spring endpoints, with positive velocity corresponding to spring compression. In circuit theory, the element analogous to the spring is the capacitor, characterized by , or . In an equivalent analog circuit, we can use the value . The inverse of the spring stiffness is sometimes called the compliance of the spring. Don't forget that the definition of impedance requires zero initial conditions for elements with ``memory'' (masses and springs). This means we can only use impedance descriptions for steady state analysis. For a complete analysis of a particular system, including the transient response, we must go back to full scale Laplace transform analysis. Note that digitization by the bilinear transform is closely related to the Wave Digital Filter (WDF) method introduced in Appendix F. Section 9.3.1 discusses a bilinearly transformed mass colliding with a digital waveguide string (an idealized struck-string example). Equation (7.2) is also known as the backward difference approximation of differentiation. See §C.2.1 for a discussion of using the FDA to model ideal vibrating strings. in any continuous-time transfer function (Laplace transform of an integro-differential operator) to obtain a discrete-time transfer function (z transform of a finite-difference operator). As discussed in §8.3.1, the FDA is a special case of the matched transformation applied to the point . Note that the FDA does not alias, since the conformal mapping is one to one. However, it does warp the poles and zeros in a way which may not be desirable, as discussed further on p. below. Thus, the first-order difference (derivative approximation) is represented in the time domain by . We can think of as since, by the shift theorem for transforms, is the transform of delayed (right shifted) by samples. where denotes a unit-sample advance. This definition is preferable as long as one sample of look-ahead is available, since it avoids an operator delay of one sample. Equation (7.5) is a zero phase filter, meaning it has no delay at any frequency, while (7.4) is a linear phase filter having a delay of sample at all frequencies. This difference equation is diagrammed in Fig. 7.16. We recognize this recursive digital filter as the direct form I structure. The direct-form II structure is obtained by commuting the feedforward and feedback portions and noting that the two delay elements contain the same value and can therefore be shared . 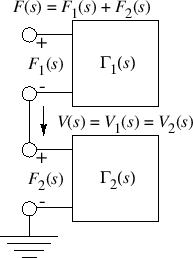 The two other major filter-section forms are obtained by transposing the two direct forms by exchanging the input and output, and reversing all arrows. (This is a special case of Mason's Gain Formula which works for the single-input, single-output case.) When a filter structure is transposed, its summers become branching nodes and vice versa. Further discussion of the four basic filter section forms can be found in . Figure 7.16: A direct-form-I digital filter simulating a mass created using the bilinear transform . While the digital mass simulator has the desirable properties of the bilinear transform, it is also not perfect from a practical point of view: (1) There is a pole at half the sampling rate ( ). (2) There is a delay-free path from input to output. The first problem can easily be circumvented by introducing a loss factor , moving the pole from to , where and . This is sometimes called the ``leaky integrator''. The second problem arises when making loops of elements (e.g., a mass-spring chain which forms a loop). Since the individual elements have no delay from input to output, a loop of elements is not computable using standard signal processing methods. The solution proposed by Alfred Fettweis is known as ``wave digital filters,'' a topic taken up in §F.1. Model discretization by the FDA (§7.3.1) and bilinear transform (§7.3.2) methods are order preserving. As a result, they suffer from significant approximation error, especially at high frequencies relative to half the sampling rate. By allowing a larger order in the digital model, we may obtain arbitrarily accurate transfer-function models of LTI subsystems, as discussed in Chapter 8. Of course, in higher-order approximations, the state variables of the simulation no longer have a direct physical intepretation, and this can have implications, particularly when trying to extend to the nonlinear case. The benefits of a physical interpretation should not be given up lightly. For example, one may consider oversampling in place of going to higher-order element approximations. The FDA and bilinear transform of the previous sections can be viewed as first-order conformal maps from the analog plane to the digital plane. These maps are one-to-one and therefore non-aliasing. The FDA performs well at low frequencies relative to the sampling rate, but it introduces artificial damping at high frequencies. The bilinear transform preserves the frequency axis exactly, but over a warped frequency scale. Being first order, both maps preserve the number of poles and zeros in the model. We may only think in terms of mapping the plane to the plane for linear, time-invariant systems. This is because Laplace transform analysis is not defined for nonlinear and/or time-varying differential equations (no plane). Therefore, such systems are instead digitized by some form of numerical integration to produce solutions that are ideally sampled versions of the continuous-time solutions. It is often necessary to work at sampling rates much higher than the desired audio sampling rate, due to the bandwidth-expanding effects of nonlinear elements in the continuous-time system. A tutorial review of numerical solutions of Ordinary Differential Equations (ODE), including nonlinear systems, with examples in the realm of audio effects (such as a diode clipper), is given in . Finite difference schemes specifically designed for nonlinear discrete-time simulation, such as the energy-preserving ``Kirchoff-Carrier nonlinear string model'' and ``von Karman nonlinear plate model'', are discussed in . The remaining sections here summarize a few of the more elementary techniques discussed in . denotes the time derivative of , and is a vector (any length) of the system input signals, if any. Thus, Eq. (7.8) says simply that the time-derivative of the state vector is some function depending on time , the current state , and the current input signals . The basic problem is to solve for the state trajectory given its initial condition , the system definition function , and the input signals for all . where denotes the approximation to computed by the forward Euler method. Note that the ``driving function'' is evaluated at time , not . As a result, given, and the input vector for all , Eq. (7.10) can be iterated forward in time to compute for all . Since is an arbitrary function, we have a solver that is applicable to nonlinear, time-varying ODEs Eq. (7.8). Because each iteration of the forward Euler method depends only on past quantities, it is termed an explicit method. In the LTI case, an explicit method corresponds to a causal digital filter . Methods that depend on current and/or future solution samples (i.e., for ) are called implicit methods. When a nonlinear numerical-integration method is implicit, each step forward in time typically uses some number of iterations of Newton's Method (see §7.4.5 below). Because the derivative is now evaluated at time instead of , the backward Euler method is implicit. Notice, however, that if time were reversed, it would become explicit; in other words, backward Euler is implicit in forward time and explicit in reverse time. Thus, the trapezoidal rule is driven by the average of the derivative estimates at times and . The method is implicit in either forward or reverse time. Imagine a plot of versus , and connect the samples with linear segments to form a sequence of trapezoids whose areas must be summed to yield an approximation to . Then the integral at time , , is given by the integral at time , , plus the area of the next rectangle, , plus the area of the new triangular piece atop the new rectangle, . In other words, the integral at time equals the integral at time plus the area of the next trapezoid in the sum. Newton's method ,[166, p. 143] finds the minimum of a nonlinear (scalar) function of several variables by locally approximating the function by a quadratic surface, and then stepping to the bottom of that ``bowl'', which generally requires a matrix inversion. Newton's method therefore requires the function to be ``close to quadratic'', and its effectiveness is directly tied to the accuracy of that assumption. For smooth functions, Newton's method gives very rapid quadratic convergence in the last stages of iteration. Quadratic convergence implies, for example, that the number of significant digits in the minimizer approximately doubles each iteration. When the is any quadratic form in , then , and Newton's method produces in one iteration; that is, for every . A semi-implicit method for numerical integration is based on an implicit method by using only one iteration of Newton's method [354,555]. This effectively converts the implicit method into a corresponding explicit method. Best results are obtained for highly oversampled systems (i.e., is larger than typical audio sampling rates). where denotes an estimate of the second time derivative . We have looked at a number of methods for solving nonlinear ordinary differential equations, including explicit, implicit, and semi-implicit numerical integration methods. Specific methods included the explicit forward Euler (similar to the finite difference approximation of §7.3.1), backward Euler (implicit), trapezoidal rule (implicit, and equivalent to the bilinear transform of §7.3.2 in the LTI case), and semi-implicit variants of the backward Euler and trapezoidal methods. As demonstrated and discussed further in , implicit methods are generally more accurate than explicit methods for nonlinear systems, with semi-implicit methods (§7.4.6) typically falling somewhere in between. Semi-implicit methods therefore provide a source of improved explicit methods. See  and the references therein for a discussion of accuracy and stability of such schemes, as well as applied examples. Other well known numerical integration methods for ODEs include second-order backward difference formulas (commonly used in circuit simulation ), the fourth-order Runge-Kutta method , and their various explicit, implicit, and semi-implicit variations. See  for further discussion of these and related finite-difference schemes, and for application examples in the virtual analog area (digitization of musically useful analog circuits). Specific digitization problems addressed in  include electric-guitar distortion devices [553,556], the classic ``tone stack''  (an often-used bass, midrange, and treble control circuit in guitar amplifiers), the Moog VCF, and other electronic components of amplifiers and effects. Also discussed in  is the ``K Method'' for nonlinear system digitization, with comparison to nonlinear wave digital filters (see Appendix F for an introduction to linear wave digital filters). The topic of real-time finite difference schemes for virtual analog systems remains a lively research topic [554,338,293,84,264,364,397]. For Partial Differential Equations (PDEs), in which spatial derivatives are mixed with time derivatives, the finite-difference approach remains fundamental. 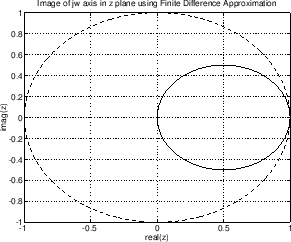 An introduction and summary for the LTI case appear in Appendix D. See  for a detailed development of finite difference schemes for solving PDEs, both linear and nonlinear, applied to digital sound synthesis. Physical systems considered in  include bars, stiff strings, bow coupling, hammers and mallets, coupled strings and bars, nonlinear strings and plates, and acoustic tubes (voice, wind instruments). In addition to numerous finite-difference schemes, there are chapters on finite-element methods and spectral methods. In this chapter, we looked at the fundamentals of lumped modeling elements such as masses, springs, and dashpots. The important concept of driving-point impedance was defined and discussed, and electrical equivalent circuits were developed, along with associated elementary (circuit) network theory. Finally, we looked at basic ways of digitizing lumped elements and more complex ODEs and PDEs, including a first glance at some nonlinear methods. Practical examples of lumped models begin in §9.3.1. In particular, piano-like models require a ``hammer'' to strike the string, and §9.3.1 explicates the simplest case of an ideal point-mass striking an ideal vibrating string. In that model, when the mass is in contact with the string, it creates a scattering junction on the string having reflection and transmission coefficients that are first-order filters. These filters are then digitized via the bilinear transform. The ideal string itself is of course modeled as a digital waveguide. A detailed development of wave scattering at impedance-discontinuities is presented for digital waveguide models in §C.8, and for wave digital filters in Appendix F.